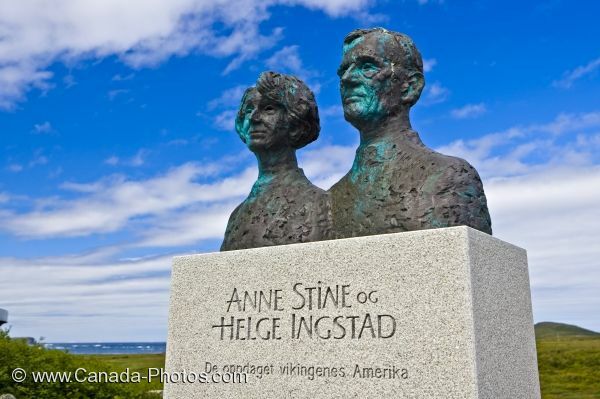 Dr. Anne Stine Ingstad and her husband Helge Ingstad were the first ones to discover the remnants that belonged to a Viking settlement at L'Anse aux Meadows National Historic Site in Newfoundland Labrador, Canada. The Ingstad couple spent seven years as the head of an excavation crew where they uncovered the remains of an 11th century Norse settlement. The statue was erected in the town of L'Anse aux Meadows in Newfoundland, as a memorial to the Ingstad's hard work and findings. Picture of a bronze statue of the Ingstad couple in the town of L'Anse aux Meadows in Newfoundland, Canada. ... , Newfoundland Labrador, Canada.